Therefore, if it is possible to offer worship that is false or vain, it is necessary that we understand what constitutes true worship. I have already defined what worship is, and I have dealt with who is able to offer worship. It is now time for us to begin looking at what constitutes worship—what are the “elements”, if you will, of worship. Once it is understood what worship is—in the realm of what is done, or practiced—then it becomes easier to recognize that which may constitute a false form of worship. Again, a distinction must be made between the 24/7 aspects of a “life of worship” and what it is we do when we gather together with our spiritual family for a specific time of worship. 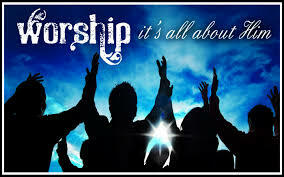 The word “worship” comes from two Old English words weorth (worth) and scipe (ship). When we add the word ‘ship’ to the end of a word such as ‘friend’ or ‘sportsman’, we are speaking of the ‘quality’ of being a friend or a good sport—friendship, sportsmanship. So, “worth-ship” speaks of the quality of having worth, being worthy—worship. Worship, then, means to declare worth, to attribute worth. We worship by declaring God’s worth. We praise God. We speak, or sing, about how good and powerful God is. One of the job descriptions of the Christian is that we should declare that God is worthy, worth more than anything else. The biblical words for worship are also instructive, though as indicated before, there is no formal definition of worship in the Bible. In both the OT and the NT there are two major words for worship. The first means to lower oneself, and the other means to serve, (which is also a lowering of self). One speaks of the bodily position of kneeling, bowing down, lying prostrate as an act of respect and submission. The other speaks of doing something for God—making a sacrifice or carrying out His instructions. Since our relationship with God should involve our entire being—heart, soul, mind, and strength—then our worship should also be with our entire being (Deut. 30:6; Mk. 12:30). When we gather together with the worshipping community, we are gathering with a group of marred, charred and scarred people. They have been in the front-lines of the battle all week long. It is not easy for them to just walk in and enter into worship. That is why a sacred place/space must be held for them—both physical and spiritual—which is the responsibility of leadership. By “holding a place” I mean keeping it as such, ie, sacred. I cannot hold a space for you if I myself am chaotic in my being. Therefore, it is incumbent upon those who are leading the worship—pastor, preacher, musicians and singers—to have already laid aside the distractions and dysfunctions of physical life before the church is called to worship. My purpose is to help them to be fully present and aware NOW. Not living in the past of frustration, or the future of worry, but to have their entire being in tune with the Spirit of God in this present moment. The first element, then, of offering true worship is to be fully present—body, soul and spirit.